Last week I came upon a 1998 study finding that the risk of heart attack was 18 times lower in people who donate blood, compared to a matched sample of people who don’t. I ran out to my local Red Cross Blood Drive, and then came home for some follow-up reading. The consensus from a handful of studies on blood donation seems to be far less dramatic, but still worth considering. Hippocrates thought that women purged blood every month to release their toxic humors, and that men might benefit from an artificially-induced version of menstruation. 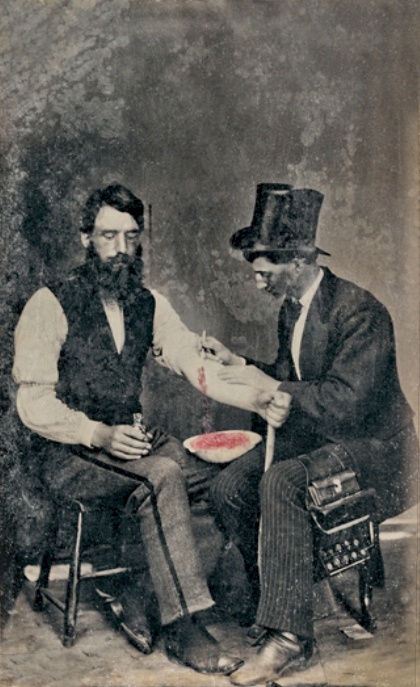 From ancient times until the 19th centuries, bloodletting was a common medical procedure. Leeches were prescribed for a wide range of ailments. Modern medical wisdom dismisses these ancient, barbaric practices as fraud, mountebankery and snake oil. But like most medical practices that stood the test of time (if not epemiology), this one held a core of truth. Don’t let your barber do this. For centuries, the local barber not only offered close shaves and sharp haircuts, but also provided medical services including bloodletting. In fact, the iconic barbershop pole with its two brass balls and red and white stripes is a vestige of the days when barbers would slit customers’ arms to relieve their ailments. The raw statistics are quite promising. Here is a study that found occasionally donating blood (every three years) is associated with a 50% drop in cardiovascular disease in men. This study finds a 40% reduction in cardiovascular risk, after adjusting for other differences between donor and non-donor groups. These [ref1, ref2] looked at short-term benefits for blood lipid profiles studies following blood donation. These two studies [ref1, ref2] found a slightly lower risk of cancer in blood donors. In a large study of US blood donors, this study found a 30% lower rate for all-cause mortality. This large Italian study found a modest decrease in overall mortality among blood donors. These were balanced with other studies that found slightly higher cardiovascular risk among frequent blood donors, and several [review] that uncovered no benefit. It is an obvious point that unhealthy people don’t respond to blood drives. How much of the statistical association with lower health risks is merely self-selection, and how much is causal? Here is a current study claiming that the unadjusted benefit is 18%, and the residual benefit after accounting for the “healthy donor effect” amounts to 7%. These percentages represent reduction in mortality rate for each additional annual blood donation. Based on this unimpeachable source, I have decided to give blood exactly 14.3 times each year, thereby reducing my risk of dying to zero. I’m old enough to remember Jack Barry on the B&W TV, the merits of Geritol for “tired blood” — a description of anemia that was intended to suggest that low iron was the primary culprit in an epidemic of chronic fatigue. Modern thinking is that, yes, anemia might limit stamina or even cause fatigue, but people who eat meat and who don’t carry a gene for hemochromatosis are unlikely to be iron-deficient. When iron is in short supply, the body can readily increase its absorption. But the body cannot easily remove excess iron, thus excess iron accumulates in the liver. In fact, too much iron is about four times more common than too little iron in a sample of people over 50 [ref]. The consequences of too little iron are short-term, but the too much iron is a risk factor for chronic disease. The best-established health risk from too much iron is elevated incidence of diabetes [ref1, ref2, ref3, ref4]. Insulin resistance, in turn, is associated with higher risk of all the diseases of old age. But several studies have found only a weak relationship between excess iron and cancer or mortality risk [ref1, ref2]. Social and emotional factors have a dominant influence on longevity. It is often overlooked, but connectedness with others, sense of satisfaction and fulfillment, healthy loving relationships are all powerfully correlated with health and life expectancy. Giving blood may be an indicator of pro-social attitudes that prefigure longevity, or it may be an active pursuit of a pro-social behavior that promotes longevity through psychological pathways. For several years, Valter Longo has been expounding a theory that an extended fast can reset the immune system. The data on blood donation suggested to me that something similar was happening, and that there might be synergistic benefit from combining a fast with blood donation. I have been doing Longo’s 5-day Fasting-Mimicking Diet every 4-6 weeks, and it happened that I was FMD-ing when I first read about the benefits of blood donation last week. I found a Red Cross blood drive on the last day of my FMD within 5 miles of my house. I chose discretion over valor, and drove out there rather than deploying the bicycle which is my habitual mode of transit. It had been several years since I have given blood, but I could hardly be surprised that there was 40 minutes of paperwork the Red Cross asked me to read and sign. Reasons for exclusion include not just infectious diseases but travel to many regions of the world, intravenous drug use (ever), homosexual activity (ever), cancer (ever), several congenital diseases….I started to feel nervous that they would ask whether I had been on a semi-fast for 5 days, or discover that I hadn’t had a meal in almost 22 hours. They didn’t ask anything of the sort, and I was able to answer all the questions truthfully. When I had trouble raising the thermometer above 96 degrees and my blood pressure read out at 85/60, they asked if this was usual for me. I offered the excuse that ”I am a marathon runner”, which is a stretch. Red Cross is strict about the rules, but they really do want our blood. So I slipped through, stretched out on the table and offered up my left arm. The procedure itself took only 15 minutes, and went off without a problem. No light-headedness or weakness–I got up afterward and walked out, hungry and more than ready to re-feed myself after 5 days of minimalist fare. I might have bicycled after all. We could be seeing benefits by removing negative factors and cytokines like TGF-beta, B2M etc… I have noticed a lot of aging issues are caused by too much of something rather than not enough. Donating blood shortens your lifespan, simply because it is unnatural to have blood drawn. Donating blood leads very frequently to vasovagal syncope, sometimes with fatal consequences. Vasovagal syncope occurs when blood pressure falls under the decency limit. The brain is therefore not supplied with enough oxygen and glucose and it goes in a stand-by position (fainting means maintaining just the vital functions in order to consume less energy). The blood circuit is a closed circuit in which the fluid (blood) has a well-established pressure. Drilling a hole into this circuit and draining an amount of fluid from it, leads to a blood pressure drop. The heart cannot function properly if the blood pressure is too high, as well as if it’s too low. While the brain is in stand-by position, the heart is overworked to catch up with the blood supply to the brain. This can lead to heart attack. It works quite like the circuit of a heating system, where the pressure must not be lower than 1 bar so the heater can function. If the pressure in such circuit falls below 1 bar, the heater stops automatically, showing an error message on the display. The parallel is this: The heater is the brain and the hot water in the heating system is the blood. I wonder these logical simple facts seem so complicated for many. I don’t think we can know such things via theory or analogy. I prefer to trust actuarial data. I found this posting to be very provocative. Your aggressive blood donation plan spurred me into looking into its possible health consequences. Your plan was by no means the most aggressive on record. George Washington gave up 32 ounces of blood in 2 days under doctor supervision (he had 3 physicians treating him). At the time, he also had what may have been a bad cold or the flu. So he was experiencing a combination of stresses. Vasovagal syncope (fainting) is an infrequent and mild complication of blood donation. Almost always, the body recovers quickly on its own. Theoretical arguments about it being “unnatural” are not as convincing to me as data about what actually happens to people who give blood. Astounding logic, donating blood lowers your lifespan simply because it is unnatural to have blood drawn! So then getting an injection of antibiotics to treat a fulmination, potentially fatal infection should also have negative effects, because it is unnatural to have antibiotics injected into you? Are you a Macedonian getting paid to give really dumb answers to destroy Josh’s members faith in the intelligence of their fellow members? Well what’s that quote about ‘chance favoring the prepared mind Josh? In your case, the finding of that 1988 study, you were prepared. In the simplest models of aging that fit with reality, you might think of aging as the loss of substances which supply ‘youthfulness’ or as the accumulation of substances that cause aging. In the Villeda experiments, it was shown that at least one chemical that accumulates causes aging signs (in cognitive functioning and neurogenesis – that substance being ‘eotaxin’). So one explanation you left out (though the father of medicine provided it) was the accumulation of toxic ‘humors’ (apart from iron) that could not otherwise be released from the body. Surprisingly, I’ve shared your thoughts on blood-letting – and agree that any such practice that did not produce observable ‘good’ results would no have persisted for hundreds or thousands of years (but then there’s the Republican party). With one pint of blood, you get rid of 60 g of protein – some misfolded ones I guess as well, so it´s kind of like protein cycling. Have you ever thought that blood is the ONLY organ we can replace/renew easily at the current point of time? And yes don´t forget getting rid of eotaxin. This brings me to the next subject: antihistamines lower eotaxin, I believe. So could cetirizin help against dementia? Josh, in the past few weeks I have looked into the idea of donating blood and I would like to share my story. My younger brother, Tom asked me why he had age spots on the back of his hands and I didn’t have any. Tom is a blue collar worker and eats lots of beef and barbeque. I suggested that he is eating to much meat and that he should cut back. I even suggested that he donate blood to reduce his iron stores. He looked at me funny and I knew that I would have to look into the matter and present a more complete explanation if I was going to get him to change. There is no need for me to give blood to try to lower my iron stores. And perhaps more importantly, if I gave blood, I could dip into the below normal range. I reported my results to my brother and he hasn’t gotten back to me with his results. The point of my story is that everyone should consider monitoring their ferritin level before (and during) an aggressive blood donation schedule. Great post Josh… What a simple, now obvious, thing to do, and I’m in to do it. And speaking of blood factors filtration, I came across an article, published in Jan 2015, and of interest to you and Dr. Katcher. The article says that we should attach blood filters to ourselves that take out the age-related signal molecules and add back the youth promoting signals. I’m all for it. But we don’t yet know the right combinations of blood factors, and we don’t know how to adjust them for individual differences, and we don’t know how often this would have to be done in order to sustain an anti-aging benefit. I’m glad people are working on it. We now have Engineers who understand the Big Picture Science of Longevity. And not only that, they also are tuned into the importance of the Circulatory System Milieu. Did I mention that they live in Iran? I thought that place was cut off from science? I assume they’re at the ready to build the device they’ve got a schematic of as soon as, well, as soon as… um… we figure out, hmm, The Details of what the Blood Factors are, hmm, and in what amounts, oh my! ?, they should be repressed or increased. And there is now a first theoretical picture of the device we’ve imagined might exist published in a journal. And they’ve even defined a few important process steps and I thought you and your readers should know about it! About iron, it seems vitamin C can get oxidized by iron content on food before it gets absorbed. That’s why I avoid eating them together when getting iron from animal sources, as opposed to vegetarian sources which actually gets potentialized (the iron that is, so maybe also avoid here too). My question is, in this process of oxidation do the iron becomes less bioavailable as well or does it work as a catalyst? Because this could be a way to diminish iron surplus while still eating animal sources. Basically inverting my logic above, which was meant to maximize iron absorption. It had only been 18hrs into a fast and I fainted after giving blood. I felt dizzy watching the nurse pick up my pint of blood and massage the bag, swooshing the blood around in his hands. When I asked for a drink of orange juice, I heard the nurse shout a code name and “her lips are blue” before my upper body was tilted down and legs propped up. All this happened despite a high iron count. Giving blood and fasting was not a good combination for me. I’m on day 2 of my first ever 4-day fast. I’ve decided to try this since I’ve noticed in the last 3 years, I’ve aged considerably. I’m 38, 5’2″ and at 134lbs, I also need to lose 20lbs. I know fasting is not a good weight loss tool but I’ll focus on calorie restriction in between fasts. Now that I don’t do Triathlons anymore, I won’t be worried about my performance and I’ll just be focusing on yoga and light training. I just have to convince my bf that I haven’t adopted an anorexic lifestyle as he is skeptical of the benefits of fasting. My understanding of blood, is that each cell can only reproduce so many times during our lifetime. My question is whether that is a misunderstanding, and if not, then isn’t it logical to assume we are shortening our own lifeline by donating? I understand where you got this impression, but it’s a misinterpretation. It’s true that stem cells develop short telomeres with age and slow down. But people don’t die because they run out of blood cells. The direct indications are that donating blood lowers mortality. Josh, this a great article, and you hit many high points (including hormesis) accurately. I’m going to save the link to this article and promote it. You even work in Sardi, the giant in this field, tangentially. Thank you.